Yesterday marked the 70th anniversary of Operation Overlord, the Invasion of Normandy on 6 June 1944. 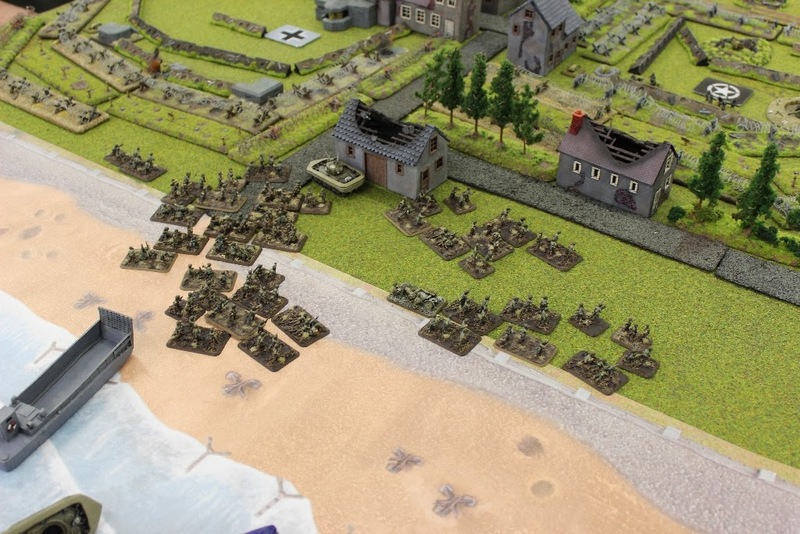 It seemed proper to mark the historic event with a Flames Of War battle report featuring the Big Red One on Omaha Beach. This battle also marks the first in my series of Citizen Soldier games. After several months of preparation, I was ready to hit the beach and I chose 6 June 2014 as the launch date for my article series. I was pleased to kick things off with a game against my brother Andrew. We don't get in enough games these days, so I was happy to be able to slot this one in. 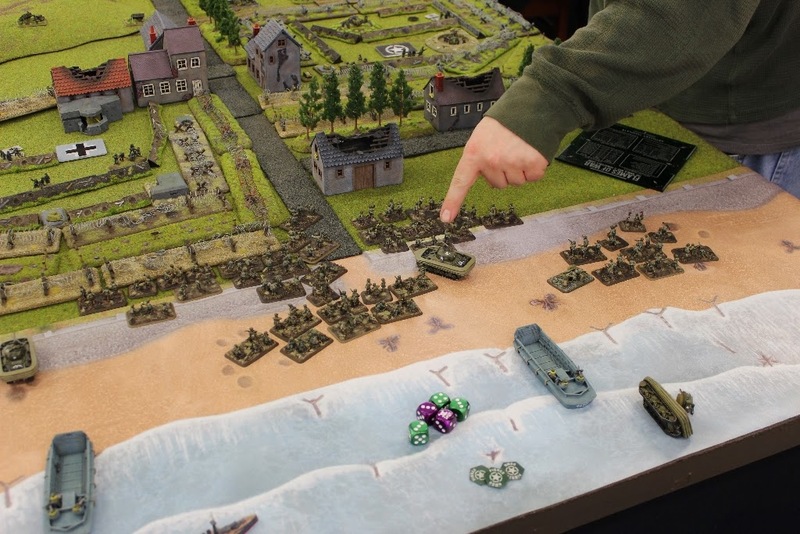 The obvious mission to play was Hit the Beach, found in the Normandy Battles supplement or on the Flames Of War website here... We wanted a big game, so set the Germans at 1500 points. The mission then gives the Allies an additional 25% more points, so I had 1875. As a long-time fortifications user, Andrew was keen on the prospect of defending Omaha Beach with the 352. Infanteriedivision. Using history as a template, Andrew formed two Wiederstandeneste (WN), WN60 and WN61, both situated on Omaha Beach. WN60 was forified with mortars, a flak nest, an 7.5cm Feldkannon nest, and an R-35 turret bunker. This he placed on my right flank, slightly back from the beach, but still in a position to support WN61. WN61 was placed forward slightly to cover the actual beach landing. 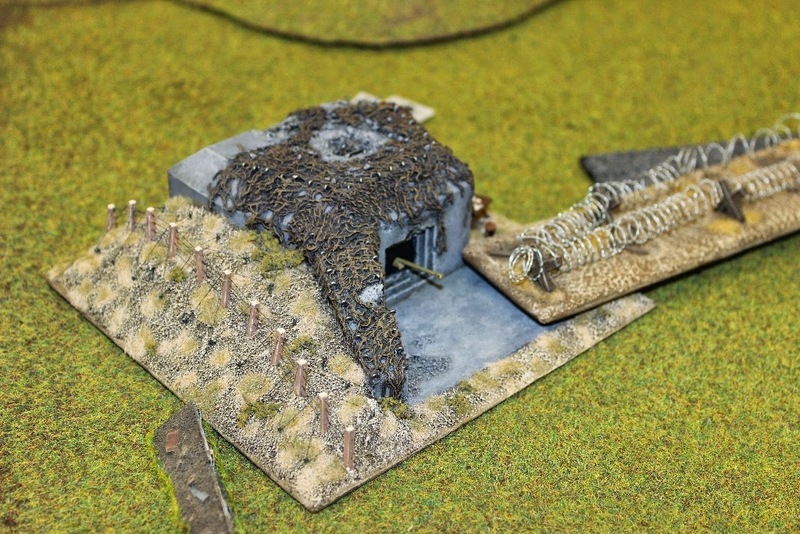 Armed with more pillboxes, than the other strongpoint, this was able to absorb a lot more punishment. It was only vulnerable in the rear, however Andrew had that area locked down with WN60. Andrew then had five additional minefields and two stretches of barbed wire which he used to link the two Wiederstandneste together. He had belts of wire and mines all over the place! Finally, his troops were further reinforced with six 28cm sWG41 static rocket launchers. These were deployed wisely on the high ground overlooking the beach. I wanted to field something fairly typical of the Big Red One's Normandy landings. I wanted everything to go in on foot via landing craft, with the exception of the DD tanks that were to swim ashore under their own power. To that end, I stocked up on Boat Sections and Support Boat Sections. 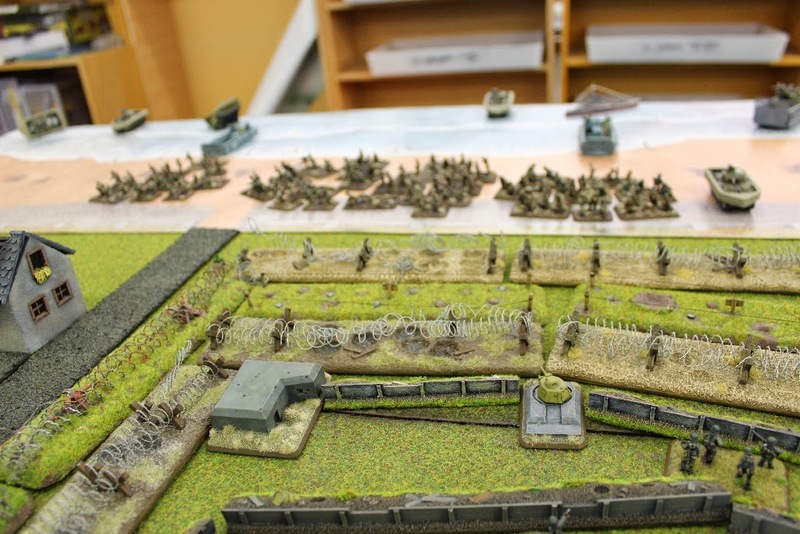 I also took a Ranger platoon to help keep the assault moving forward and a dismounted I&R platoon in case the German infantry tried to go to ground (dismounted also meant I could recycle them as needed). 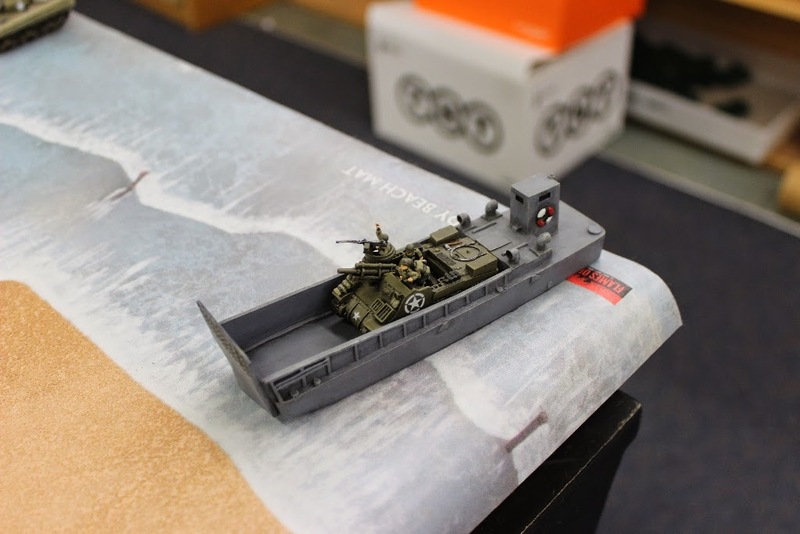 The M7s were loaded into an LCM as a floating battery to support the Destroyer Naval Gunfire Support. I chose the destroyer because I knew that there was not a lot that NGFS could actually destroy out of a Wiederstandneste, so I chose to save some points and go with the lighter option. My first assault wave hits the beach! 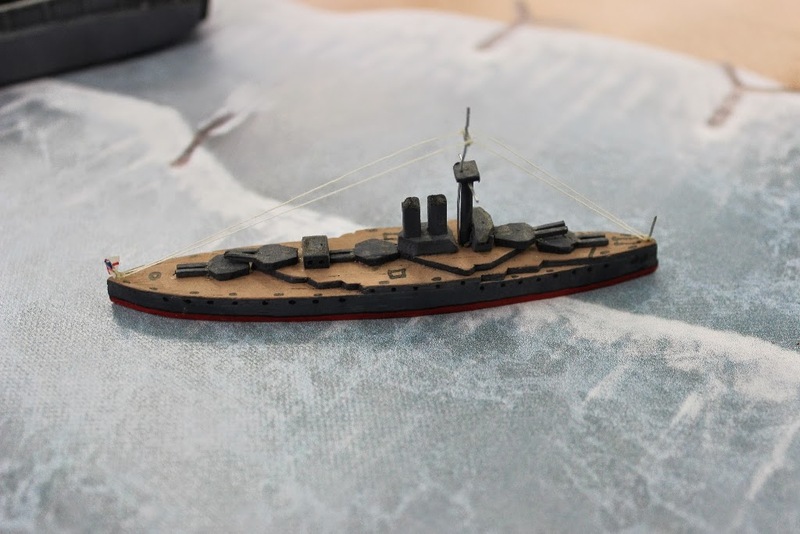 While not a destroyer, this was my NGFS marker, a scratch-built Jutland veteran. The plan was simple: punch through WN60 and overrun the objective as quickly as possible. That meant stacking my troops on my right, which I did accordingly. The current was running left, and after some navigation problems, most of my troops ended up landing in front of WN61 instead! The DD-tanks ran into a bit of trouble early on, with two getting delayed for a turn, one arriving on the far left, and the last two getting swamped and sunk on the swim in. Luckily, the preliminary bombardment of the beach had knocked out a large number of MG teams from each Wiederstandneste. The DD-tanks were a bit of a handful. Two delayed, two swamped and sunk, leaving only one to paddle ashore in the first wave! The first wave is ashore! The first wave of infantry was ashore and pushing inland under the raking fire of WN61's machine-gun pillboxes. 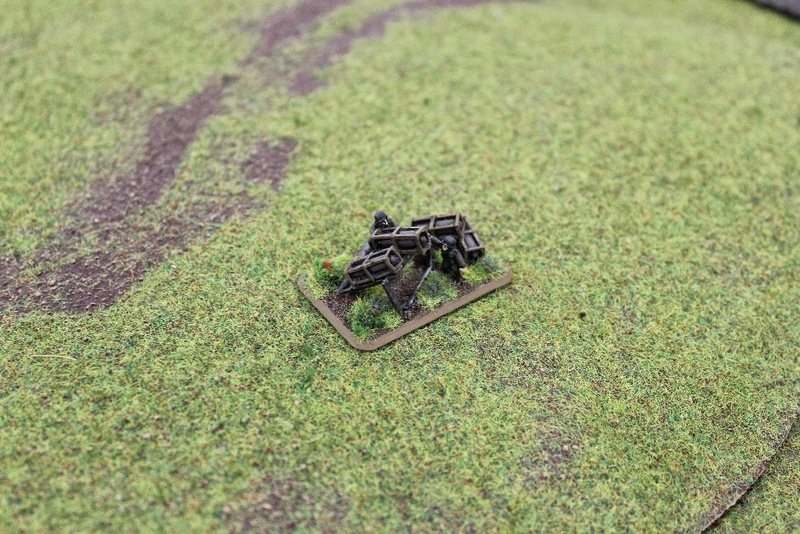 The sections' mortars were a huge help as they began to knock out nests and enemy infantry to lighten the return fire. Still, the Rangers were wiped out by focused machine-gun fire and Andrew unleashed some of his rockets, which all but wiped out a boat section and knocked out the one Sherman-DD that had made it ashore with the first wave. A rocket barrages rip through the Rangers, a boat section, and a DD Sherman. I had to make a decision about changing my objectives. With most of my troops on the left, I decided to target WN61 instead. 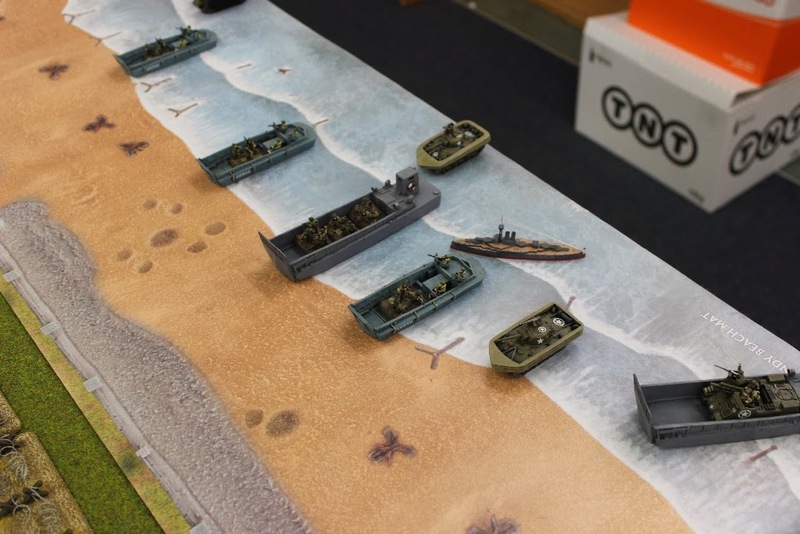 The second wave arrived and delivered some more Rangers and another Boat Section (then the landing craft promptly got stuck in the surf for 5 turns!). The delayed Sherman DDs arrived as well and help push on the advance. Small US gains are matched with intense German firepower. The German return fire was again stiff, eliminating another boat section and seriously reducing the newly arrived Rangers. More rockets slammed into the beach zone, further causing casualties in the boat sections. 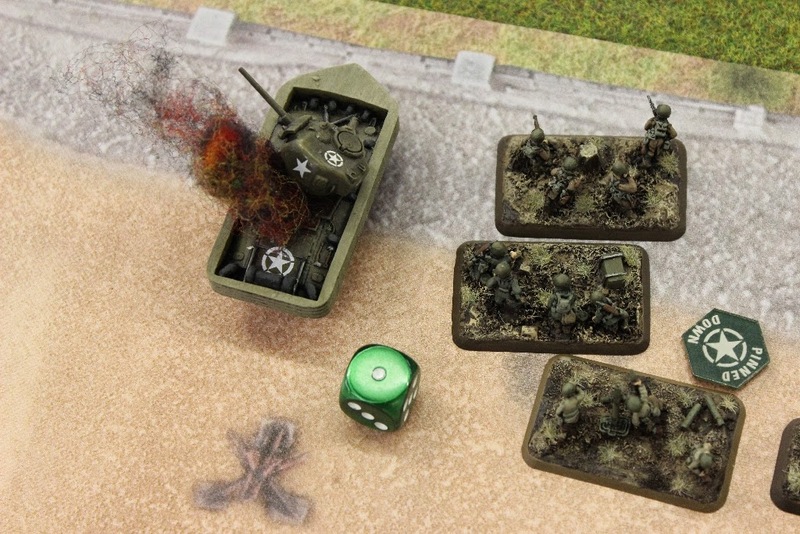 The anti-tank pill boxes engaged the Shermans, but were unable to knock them out. 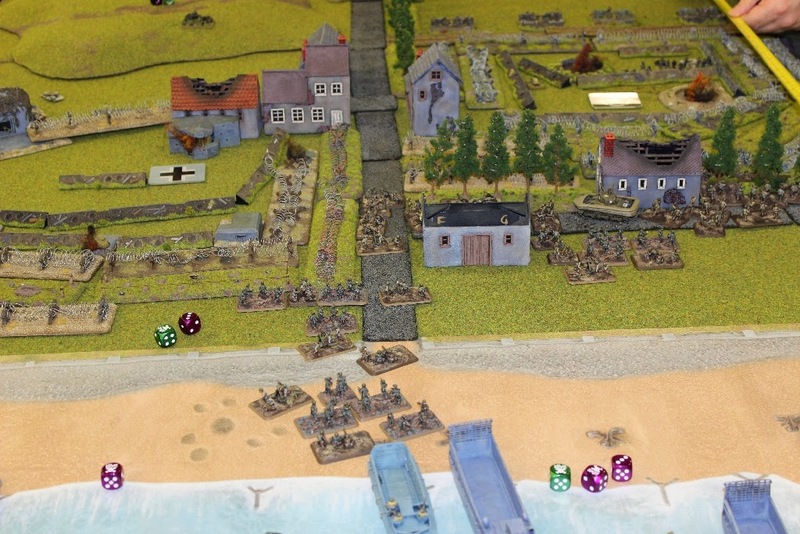 After several turns I had managed to creep up to about 6" beyond the seawall, however those troops were now under fire from both of Andrew's Wiederstandneste. More troops arrived and now all four boat sections (some understrength) and a few support boat sections were in position to start a big push into WN61. Not much to show for seven turns of fighting! 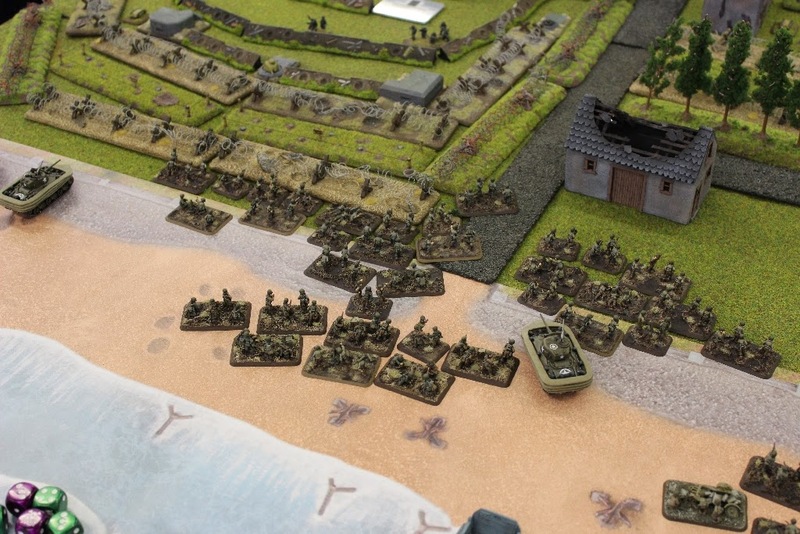 The third Ranger platoon now took up the lead and formed a spear point to cover the boat sections, while the Destroyer NGFS, Priests, and Sherman-DD tanks eliminated the last of the infantry and nests covering the objective. With only three pillboxes remaining, the way was open, I just needed to get past all of the bunkers and rocket fire. The boat sections then blew up a strip of barbed wire and prepared for the final assault. Meanwhile, other sections kept WN60 underfire to make sure the main effort was covered. A deadly 5cm KwK bunker is finally silenced by a Sherman DD tank. WN60 is relieved of it's nests by Sherman and 60mm mortar fire. The mission ends on turn 13 and I need to be holding an objective, so when we rolled into turn 9 with little more than 10" of gained ground, I knew the time was now or never. I needed to get into the center of WN61 as quickly as possible. The Ranger platoon was once again a shadow of its former self with three teams, but I elected to keep them on the table to help try and clear some wire. Under normal circumstances, I'd be happy just to try and run through the wire on a successful skill check (3+ for my Big Red One boat sections), but Andrew had two belts of wire, and in some places a third belt of mines. So I needed to lessen the odds a bit and remove some of the wire. The Rangers and an understrength Support Boat Section went to work and removed two pieces of wire, leaving only a single belt of wire remaining. I sent in a boat section, which managed to mostly get across the wire. Now, with the two Machine-gun Pillboxes flanked I launched an assault on one of them after prepping the target with a flame-thrower. Pinned, the machine-gun pillbox destroyed a rifle team before itself being demolished. 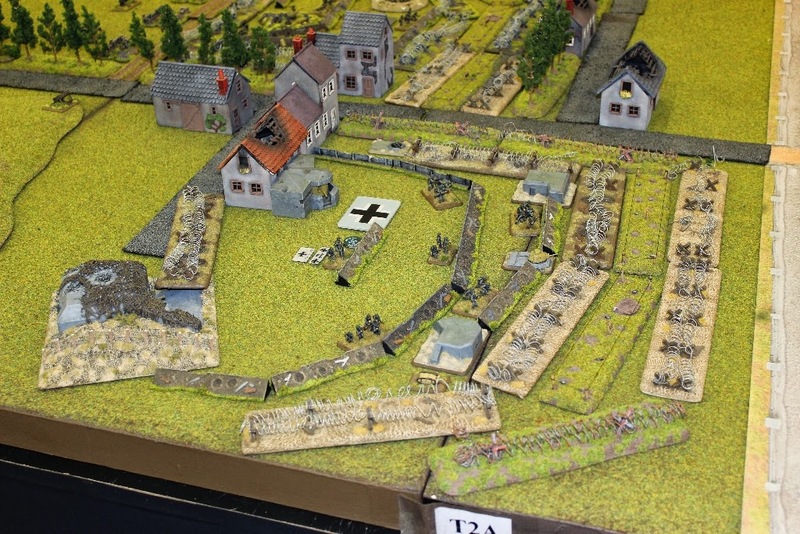 I then fell back toward the objective into the German trenches. "We're in! Who's got the flag?" 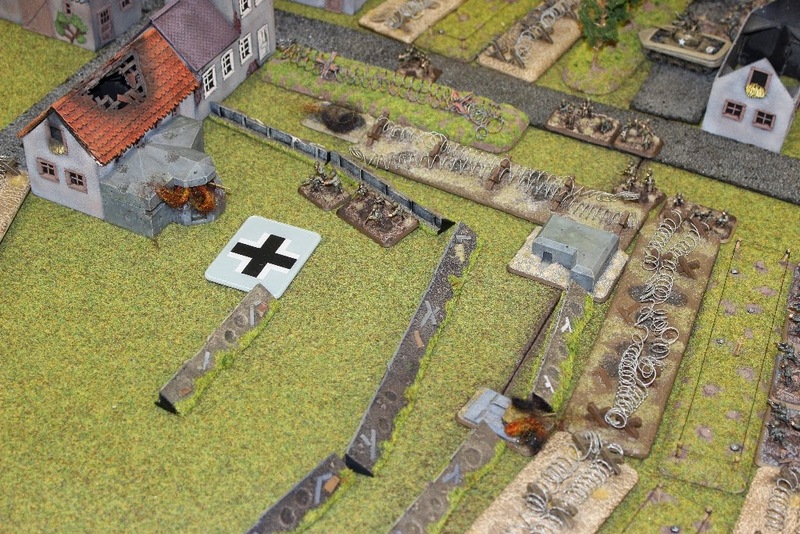 I now needed to just hold my gains for the German turn, which wasn't easy as the platoon holding the objective was well below half-strength and only barely managed to stay on the table with the help of my Company Commander! 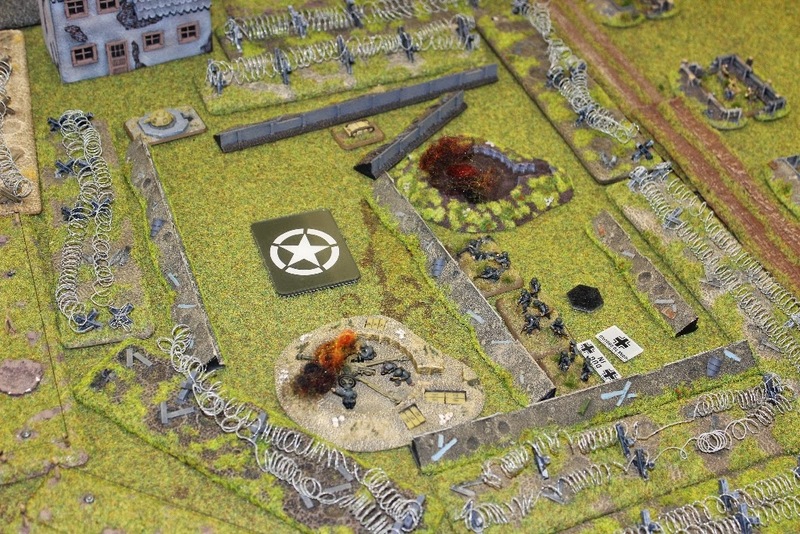 WN61's last pillboxes try and knock out the US invaders. That platoon of troops was the target for everything remaining in Andrew's arsenal. 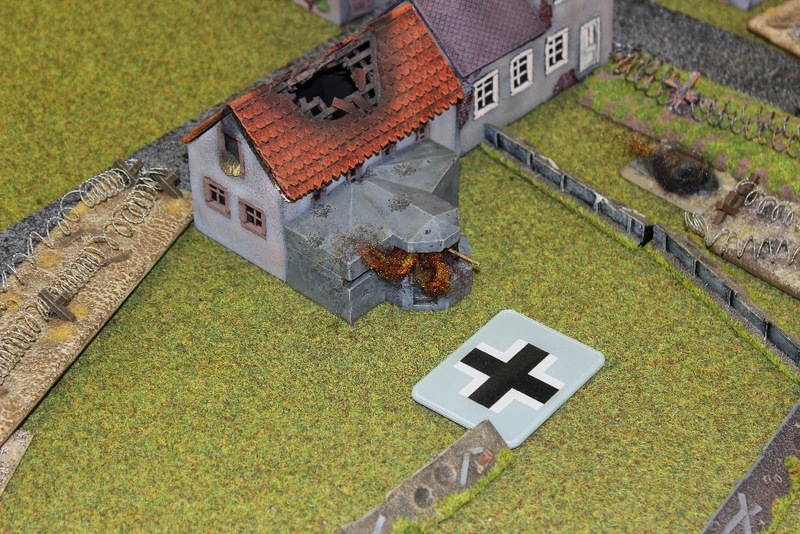 The anti-tank pillbox took a break from its fruitless battle with Shermans and fired at the boat section, the last of Andrew's static rocket launchers were fired at them, and even Panzerschreck and turret bunker fire was brought to bear. A rifle team was destroyed, but the platoon held and passed their last morale check. The US flag was finally raised on WN61 and the hard-fought battle was won. According to the mission's victory conditions it was a minor US victory for taking and holding the objective Andrew placed in WN61. It was a tough battle! Thanks to Andrew for a fun, exciting game and for helping me kick of this article series! Sounds (and looks) like a fantastic game. A truly awesome collection of models and scenery! Thanks! But I must admit that I can't take credit for the actual terrain aside from the bunkers. Beautiful game - love the German turret emplacements and the D-Day tribute was fitting! Turrets are deadly! While seeming easy to knock out, they are still hard to prioritize over HMG nests and pillboxes, and so they tear it up on the battlefield! Great game. That scenario looks great for recreating a beach landing. I love how the Americans have to struggle with delayed troops and fighting the beach conditions as well as the enemy in this scenario. 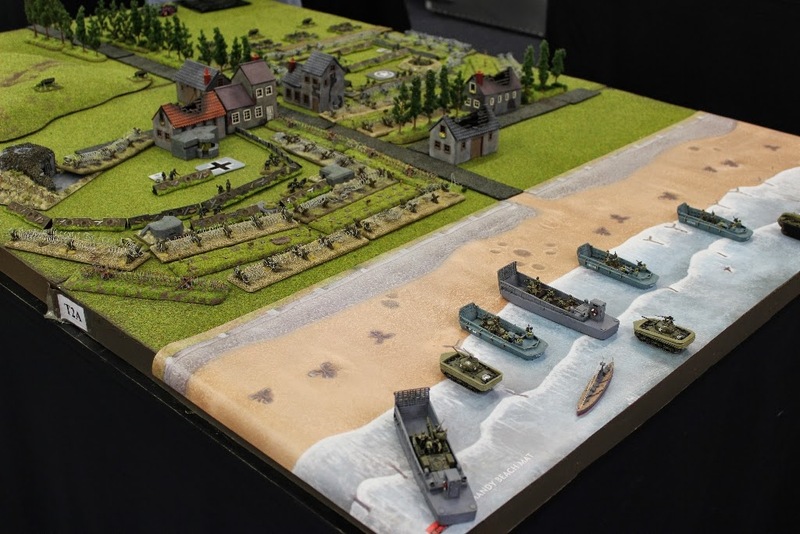 The table and models all look fantastic. I'm looking forward to more! Thanks! The game was so close! I forgot to mention that for a few turns my landing craft actually got stuck in the surf and there was a few turns where it was hard to get troops ashore for lack of transport! Great AAR Mike, looking forward to part2. Great start to the series, can't wait to see the Yanks continue their attack! 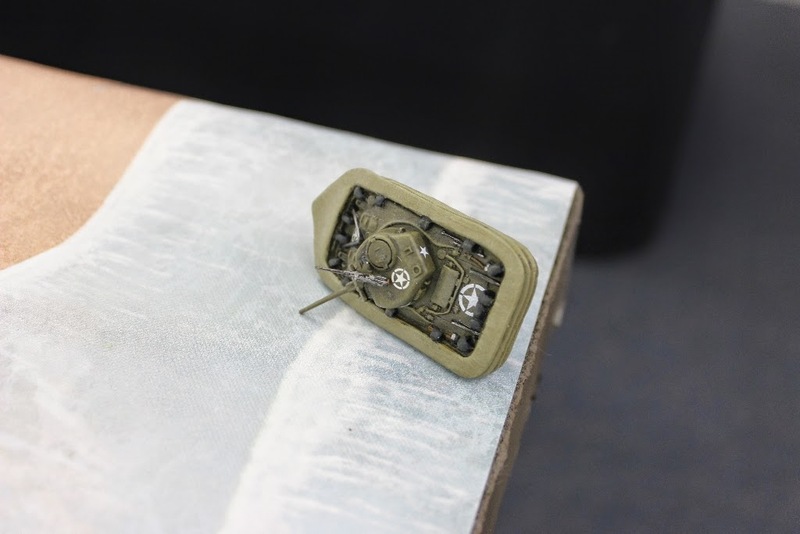 I may be wrong here, but shouldn't the fortifications (barbed wire, minefield, trench, etc) in the platoons be back 6" from the side table edges? Good catch. I missed that. 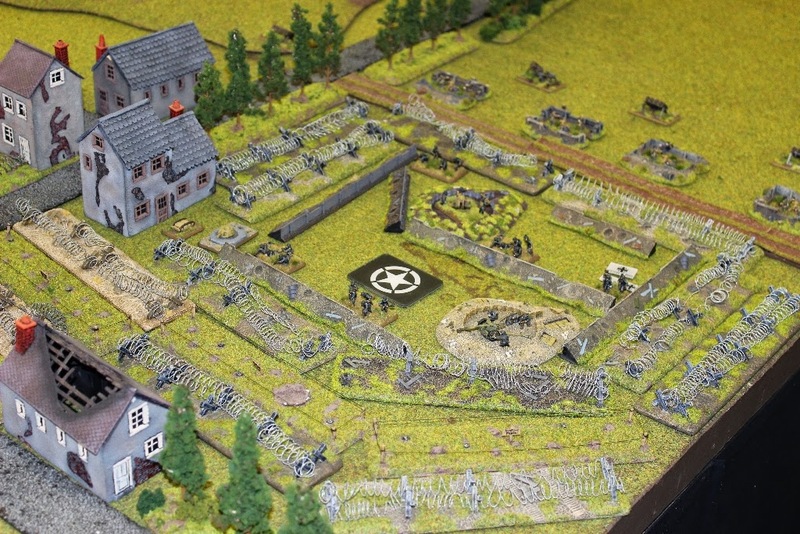 To be honest, there were so many to deploy and there was so little room that Andrew would have had to place them behind or in front of the fortification. As it was I went up the middle gap so more fortifications forward of behind wouldn't have made a difference to either of us. Yeah, it defiantly gets clogged up. 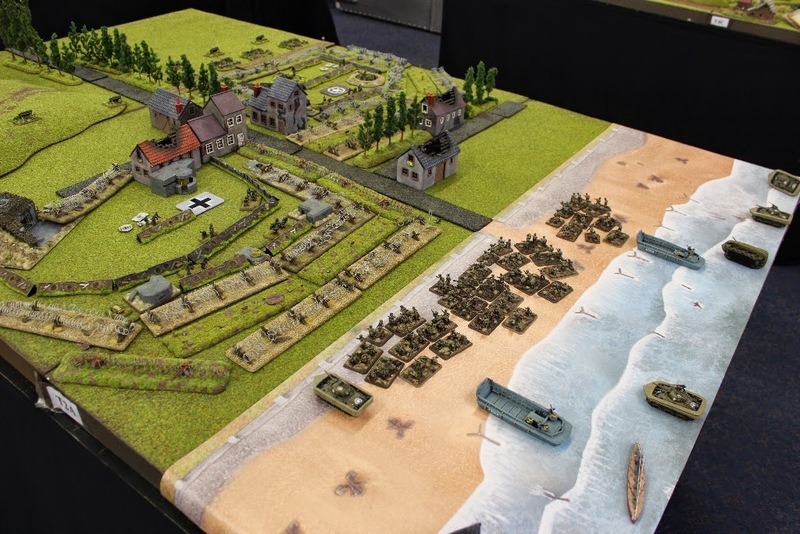 I played this in a D-Day tournament and had around 4-5 layers of wire in front of my platoons. Looked like it went really well though! A smashing report, eloquently told, and a great tribute too. Thank you. Great looking game. Is that beach and sea a new product? It's a great idea.